Artful Affirmations: Tea Cup Tuesday-August Already! 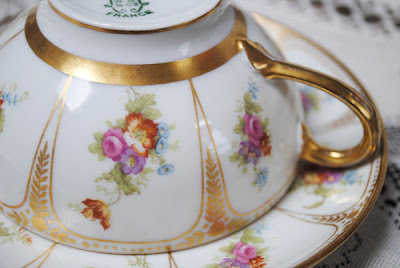 I am delighted to be here with you all again today for Tea Cup Tuesday! Yay! How fun is this, sharing our beautiful tea cups and sentiments with each other. Today I am sharing two cups that are very similar in shape, weight and feel. This first one is what I have been calling my botanical cup, because of the little vignettes of flowers. The flowers are different in each section. I adore the fancy gold trims. It has a simple loop handle, and as you can see it was well loved and a good amount of the gold has been worn away by loving hands. It is a very fine, and delicate cup. All the little gold dots were applied by hand, many years ago. A close up of the plates edge. As you can see, it was created by Limoges. William Guerin began making pottery in Limoges France in 1836. His son joined him much later, around 1903. This mark could have been in use as early as 1891 or as late as 1936. But as it does not say "made in" I am thinking it would be before 1920. Here is my second cup to share for today. It is very similar to the first cup, the same cup and plate shape, and the same handle. 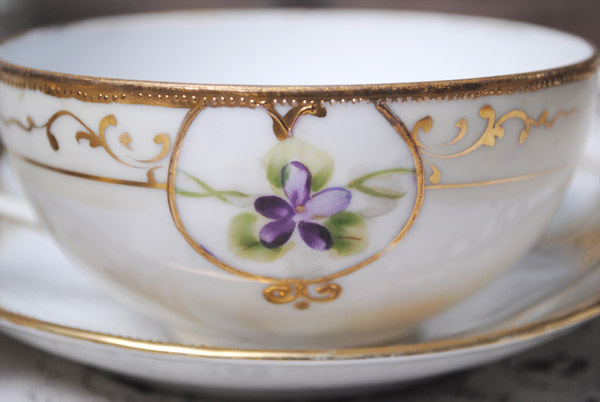 What is different is the country of origin, and the raised gold design and the hand painted flowers are much simpler in execution than that of the first cup. It is a very pretty cup, but upon close inspection you can see that the artist did not paint within the lines very well. The entire cup is hand painted. 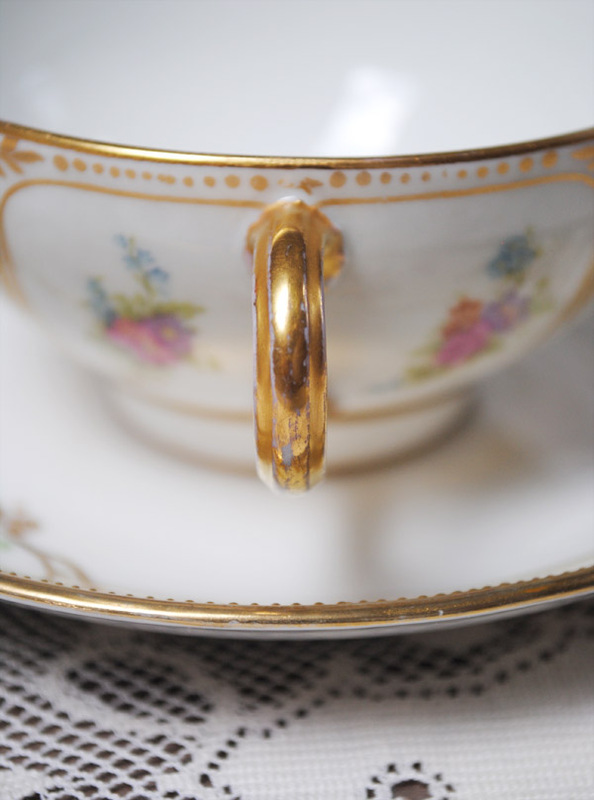 This cup too, was well loved, as the gold has rubbed off the simple loop handle with repeated use. But still, it is delicate and very sweet! The porcelain is very thin and lightweight. So tea tastes quite good in it. Did you guess? Yes, it is made by Nippon! Martha, I know you knew that right away! So, even though the cups were very similar, they were made in two totally different countries. Here is the other vintage tea cozy I bought in the UK. I love the embroidery! Such pretty vibrant color. The background is a little grey, so I am thinking of trying some Borax on it to lighten it and banish the dullness. I am just not sure how the colorful threads will do. Anyone know? Thank you so much for stopping by to visit today! I have loved having you and I enjoy reading your comments. 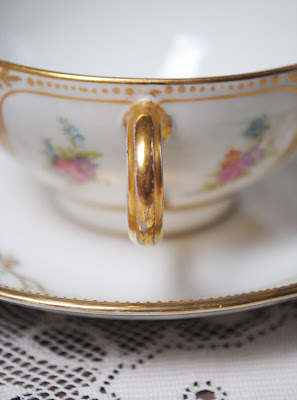 If you would like to play along with Martha and I, just go and create a post with your tea cup in it, tell us about it, show us the backstamp if you can, we love to see that. Last week I saw several cups from companies I had never heard of and that is always a delight! Once you have your post up, link that specific post to the Linky system below. Then we can come and visit you! I love the workmanship on your cozy! The teacups are gorgeous. I do not have a Limoges cup...quite elegant! My cup is not old but, I thought it was cute anyway. Yours are lovely! I like them both. The tea cozy is very cute too. What a great find. Thanks for having us! Those are both especially lovely teacups. 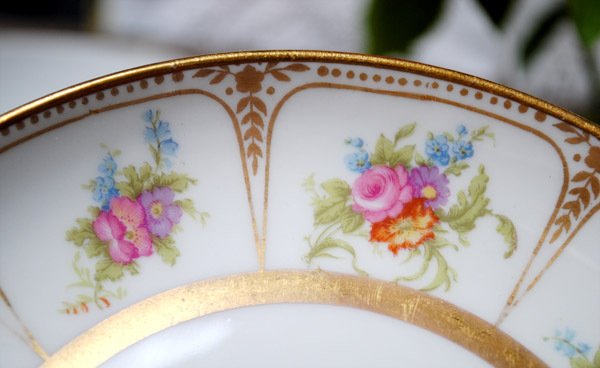 I love the delicacy and hand painted/gilded details. Lovely! Hi Terri! 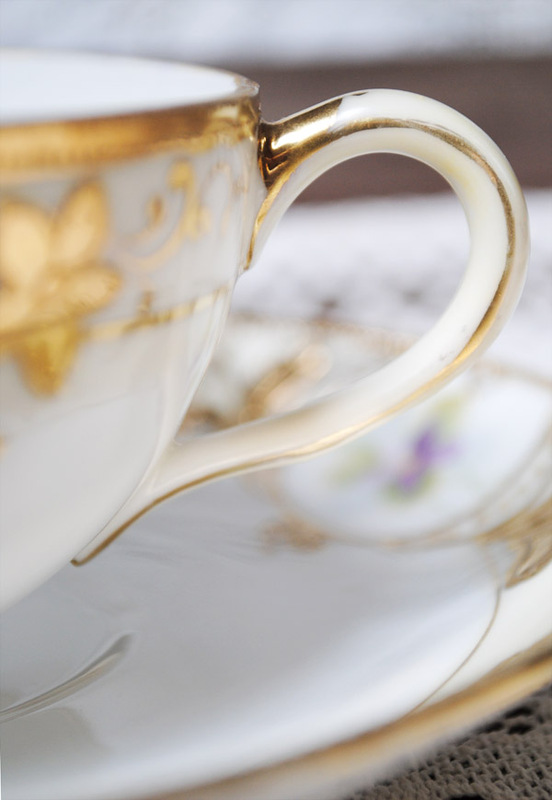 Love your teacups today! I saw a couple like them at an antique shop when I was in Newport RI last week. Almost walked out with one - but - you'll have to read my post to know why I didn't. Next time, maybe! Love the delicate florals on your selections today. 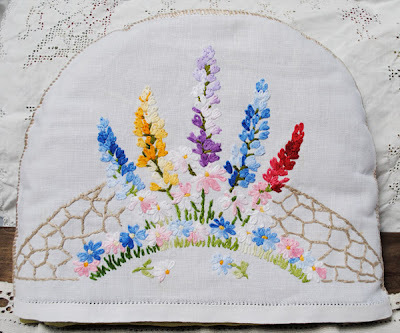 And the embroidery is lovely - I have some of my grandmother's work I'll share in future posts. Love the tea cozy. 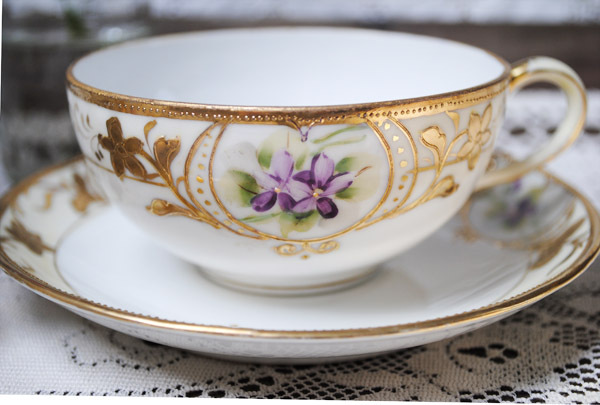 Can you imagine the conversations of those sipping their tea from the gorgeous teacups? How delightful. Limoges are so delicate & elegant. Thanks for sharing with us. So amazing and delicate...Just lovely. Beautiful cups, Terri. The pretty little purple flowers are so delicate and lovely. Oh, I do like your vintage embroidered find. I don't remember the name of the product, but there is something you can buy, usually in quilt stores, that is very safe to soak vintage fabrics and knits in, and will remove all sorts of yellow aged stains and the like. Perhaps you can check some local quilt shops and see what they have. I'll try to call the store I know sold it and see if they can tell me what it is. I'll let you know if I find out. Cannot leave Comments through Google on some blogs. Don't know why. Terri...that first cup took my breath away! They are all lovely, and that cozy has found a perfect home w/ you. Thanks for hosting and have a wonderful week. Terri, your teacups are lovely! So delicate and special, each in their own way. Thanks for sharing them with us and enjoy your week. thank you for sharing these beautiful teacups, similar and different... for your vosy, maybe some white vinegar in your washingwater might brighten the colors and take the greyness away. Oooooh! Terri, your teacups are both so elegant. I love the beautiful colors of the flowers, and the gold design on both is so elegant. And what a sweet tea cozy! 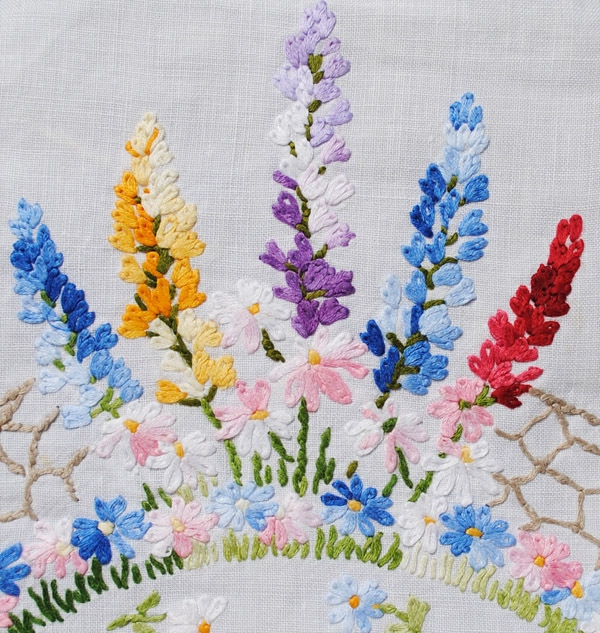 Love the beautiful, vibrant colors of the embroidery. 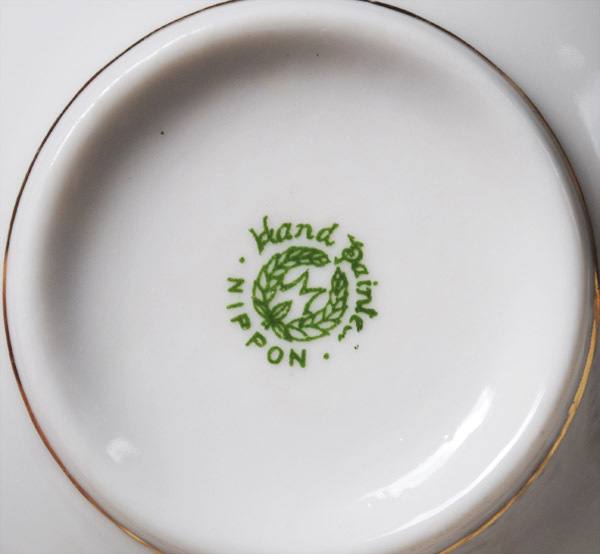 Even though I know I am supposed to prefer the Limoges teacup, I love the Japanese hand-painted best. I love everything about it and the painted violets look just like the violets that bloom around my home. You have so many lovely teacups Terri ! I am realizing I am drawn to the delicate Japanese teacups more and more. The work that seems to have gone into teacups and tea sets sold so cheaply years ago is amazing. Thank-you for hosting this , I love to read the blogs that link to Teacup Tuesday. both cups are really lovely. I wouldn't have known the difference. But both are artful and I like when china is paperthin. Thank you for sharing your treasures and for hosting this lovely event. May I invite you for a tea, too? i absolutely love both teacups, they're just gorgeous! 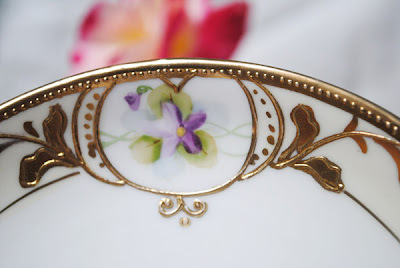 love the gold rims, the delicate handles and lovely pattern/design on them! i love your tea cosy too! me being crazy about embroidery, loving everything embroidered! thanks for sharing and hosting! Both your teacups today are beautiful. Your "botanical" cup is so delicate and the hand painted cup is also lovely - even if the painter didn't quite stay in the lines :-). I love that tea cozy. I have a nice cross-stitched one that my husband did. Now if only I could convince him to do embroidery. Wow Terri.....gorgeous...I am really drawn to the second cup...the shape and beauty of it really shines!! Love it..totally adorable!! Love the tea cozy too..the colors are charming and sweet!! Thanks for sharing your beautiful cups as always! Wishing you a happy week and sparkles wherever you go! Those are two beautiful cups, Terri. I think I might have picked the first for my very special cup, if i had spotted it! The colors are just lovely together and the gold, so elegant. Limoges is so pretty! Thank you so much for hosting for us!!! 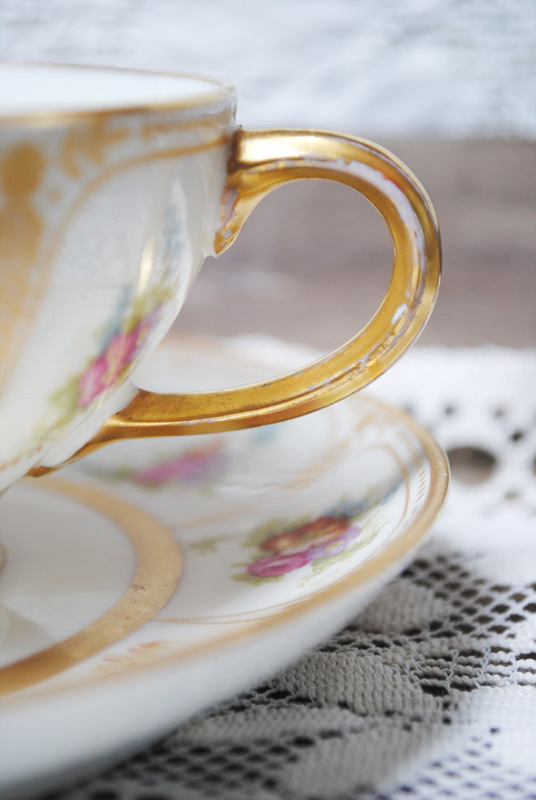 Thanks for hosting -- it's such fun to see so many tea cups gathered in one link party! LOVE the two you featured -- they are gorgeous. I always love peeking in on your teacup posts. I don't have many to share, but I enjoy yours. Have you seen the paper teacup template from Ann Wood? I thought of you when I saw it. I have one on my blog if you'd like to see it. Knowing your other work, it seems like it would be right up your alley! Lovely tea cups Terri. 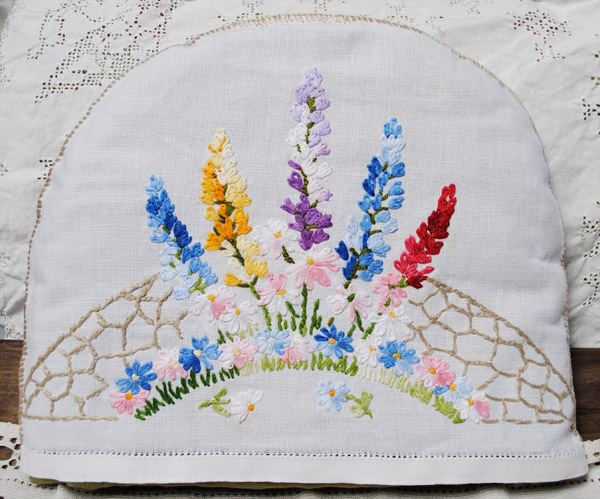 The embroidery is very lovely and has a lovely summer feel to it. Beautiful! I started a collection of tea cups/saucers and tea pots eons ago but I don't have that many. Seems like something else always comes up. I do have some treasures from my aunts and grandmother though. Oh Terri...the tea cozy is lovely! I can't decide which teacup I like best! Such beautiful offerings. 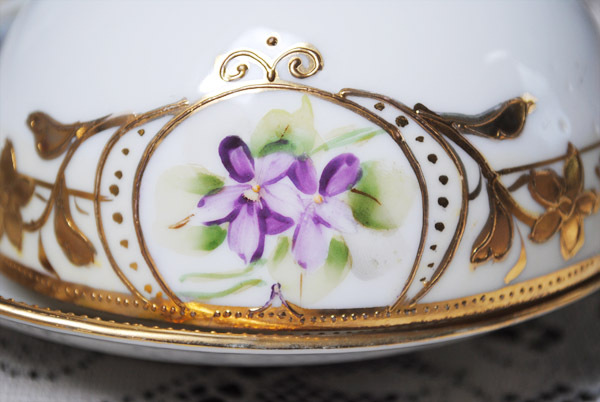 You always select such beautiful porcelain to share with us! I love the tea cups! I think the Nippon cup is great, especially for everyday use. 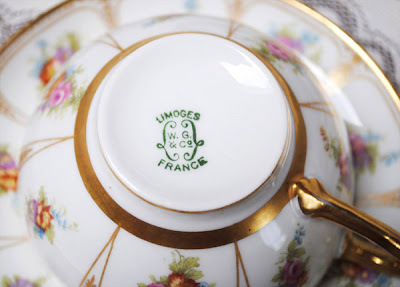 Breaking a Limoges always hurts more. LOL! The tea cozy is so cute. I hope you find a way to get it whiter and update us on how you did it. Terri I have recently became obsessed with tea! 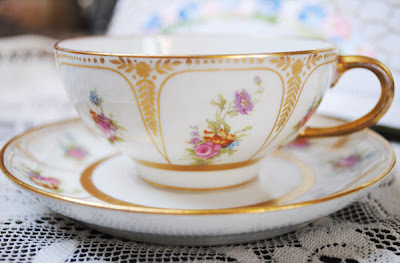 It is so hard to pass a lovely teacup up when I am out at the antique shops! I also love going out for afternoon tea! I recently picked up a blueberry Sunday tea that is amazing! I am loving my new found relaxing hobby. I hope to be able to maybe join your Teacup Tuesday post soon!